Is your company looking for alternatives to the expense and resources needed for its onsite or hosted Microsoft Exchange Server? Advanced Telepresence LLC can free your IT resources from in house or hosted Exchange environments by migrating your entire user base to the Google Apps system. A/T takes a comprehensive and case by case approach for migrating your user data, ensuring the highest uptime and seamless transition. We understand all migrations are different so we thoroughly investigate and plan for your corporation. Below is a sample migration schedule. As every business is different, during this phase Advanced Telepresence engineers will identify business requirements to be addressed for the implementation. 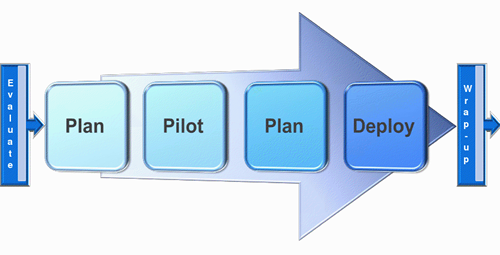 During the planning phase we will record technical details specific to your organization and associated end user information for deployment of pilot. The pilot allows for any unforeseen issues to be addressed before a full rollout so our engineers can successfully plan for the full migration. A pilot period is typically a selected group of users (both technical staff and non-technical staff) for a specified length of time. Our engineers are Google Apps specialists able to operate, admin and maintain your new deployment. Your user base will be provided access to our training materials containing video and textual tutorials covering all aspects of your new services as well as one on one assistance where needed. Migration of all existing end user data (email, contacts, calendar) from existing provider (hosted or in house Exchange Server). During this phase your user base will go live and Advanced Telepresence engineers will assist in addressing any issues found during the pilot phase. Our engineers are on call to provide post-deployment assistance and ensure continued smooth operation for your entire organization.